Private and secure communication tool - only for the use of the residents. Communication can be one-way from manager, or if chosen, interactive with residents. Topic channels are used to categorize discussion threads. Designed for optimum web and mobile viewing and posting. Mobile app for Apple iOS and Android users. Nabr Network’s communication heart is a mobile and web application called the Community Feed. The Community Feed is a scrolling news feed that is common in typical web and mobile based news feeds. Authorized access to the feed and secure side information requires authentication of the resident through the official association member list. This authentication can be done through HOA accounting software integration or manual synchronization import, handled by Nabr Network. Once authenticated, the resident can logon to their Community Feed and other secure side HOA information on mobile, desktop or tablet. The Community Feed can be set to “one-way” where only information can be posted by managers or authorized designees. Conversely, the Community Feed can be set to “interactive” where authorized residents make posts. The setting for one-way and interactive feature is your choice, Nabr Network can turn it on or off at a flip of a switch. Posts in the Community Feed are categorized by “channels” for greater eye-catching and sorting. The Association News channel is for the official HOA information by the association. Only community managers and other authorized designees can publish to this channel. Other available channels are Watch Alerts, Lost and Found, Recommendations, General, Social and Groups. A community may choose the channels they want to use. The community can also be set with custom channel names. 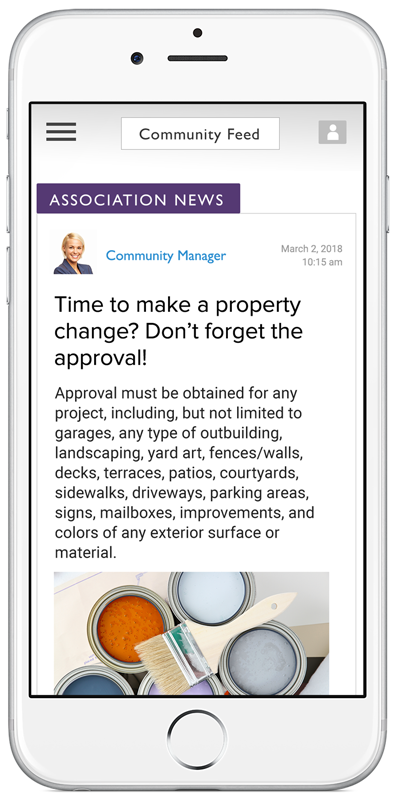 A great feature developed for the Community Feed is that residents are not required to log in every day to find out what’s new in their community association. Association News can be received via mobile push notifications, text message notifications and email notifications. Community managers and HOA administrators find these notifications especially useful in the case of an immediate need for a maximum community outreach. Nabr Network knows that many residents prefer to use their smartphones. That is why we’ve developed a downloadable HOA mobile app for Apple and Android. All interfaces in the Community Feed are user-intuitive and specifically designed and developed for mobile with community associations in mind. Our mobile development team tests the HOA communication features weekly and continues pushing seamless upgrades to the HOA apps. The Nabr Network web and mobile application has helped us provide great service to our communities by increasing communication to our owners. Boost your HOA communication tools. Discover the power of our Community Feed feature!